Paying homage to the city’s rich historical heritage and a vision to redefine luxury in a new way, Rosewood Hong Kong opened earlier this month, dominating the Kowloon luxury hotel district with a 65-storey harbourside estate. With 413 guests rooms and the city’s first urban outpost of Asaya, Rosewood’s own wellness programme, Rosewood Hong Kong is set to open its food and beverage offerings in two phases, beginning with the first series of dining establishments ready to impress. Here are what you need to know about the luxury hotel’s food and drink highlights. Named after the Holt’s Wharf where Rosewood Hong Kong now stands, the hotel’s all-day-dining establishment embraces the local cha chaan teng culture with a contemporary twist. An open-dining concept with a diverse selection of Cantonese dishes with an international twist, the selection is faithful to a local dining experience, from local milk tea and sandwiches for breakfast to dim sum and Chinese barbecues throughout the day, as well as European classics during dinner service. Holt’s Café not only offers a casual dining experience, but is also a venue where a distinctive tea programme is featured. Tea aficionados will appreciate the infusions of Chinese origins or abroad, and can select from a wide range of teas, premium aged to rare vintages, brewed to order by certified tea masters. Located opposite to Holt’s Café, The Butterfly Room is Rosewood Hong Kong’s all-day lounge and is home to a masterful design of custom furnishing and interior design by design maestro Tony Chi. The abundance of fauna and flora embellishments add elegance to the establishment—in particular, three iconic butterfly-themed works by British artist Damien Hirst, taken from his “Zodiac” series of art pieces. The Butterfly Room serves everything from Continental breakfast to the hotel’s own modern take on afternoon tea, which covers sweet and savoury morsels from homemade scones to pastries and desserts designed and prepared by the experienced pastry team led by the hotel’s executive pastry chef Holger Deh. Afternoon tea service officially commences on April 1, 2019. As part of the retail arm of the hotel’s hospitality concept, the Butterfly Patisserie is home to the hotel’s sweet offerings, created by resident executive pastry chef Holger Deh. The German-born pastry chef has custom designed a confectionery series that covers everything from cakes, pastries, chocolates, and preserves. Highlights include Deh’s ten varieties of individually-sized cakes, ranging from Tahitian vanilla millefeuille, yuzu fromage-blanc cheesecake, and raspberry and champagne choux pastry. The hotel’s own branded chocolates are crafted bean-to-bar by Deh’s team, adopting three varieties of cocoa beans, into a varietys of praline-based chocolates as well as the hotel’s unique ‘butterfly kisses’, where elongated chocolate shells are filled with fruit compotes and homemade marshmallows. Paying homage to the origins of Cheng Yu-Tung, grandfather of the Rosewood CEO Sonia Cheng, The Legacy House is a fine dining Chinese establishment at of the luxury hotel, with great respect to the tasty traditions and culinary heritage that have shaped Cantonese cuisine. The establishment offers two distinct experiences for guests, from the more casual setting at the main dining room to seven luxurious private dining rooms. 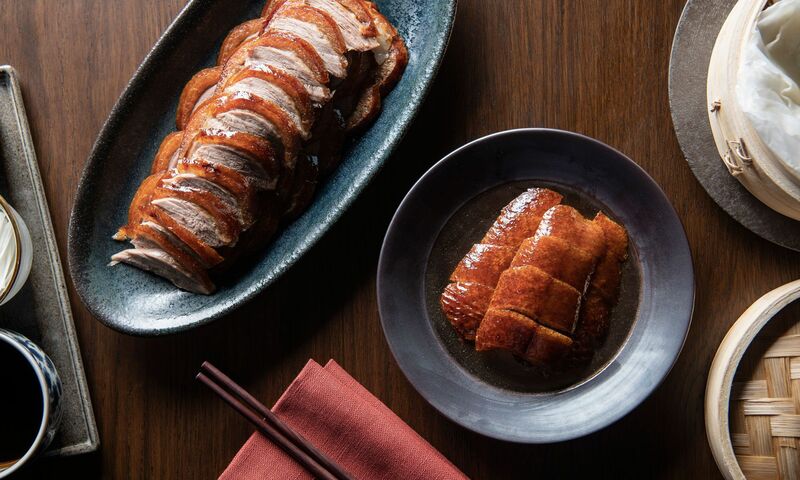 The Legacy House celebrates Shunde cuisine, as well as a range of quintessential Northern Chinese favourites such as the revered Peking Duck. The menu highlights also cover a wide selection of dim sum, served during lunch, crafted by the restaurant’s executive Chinese chef Li Chi-Wai. While Kowloon used to be candidly coined as ‘the dark side’ compared to Hong Kong island, Rosewood Hong Kong’s hub of tipples and contemporary jazz reclaims the iconic term, serving a wide range of specialty cocktails, wines, and spirits that are worth the journey. With a unique beverage programme designed by Nicolas Deneux, Rosewood’s area wine director, as well as Arkadiusz Rybak, the hotel's director of bars and assistant beverage manager Simone Rossi, Darkside’s offerings cover everything from vintage champagnes and whole-casks of port wines, as well as time-honoured classic cocktail varieties. Guests can also enjoy a bespoke blend of amaro and a Rosewood craft beer designed especially for the hotel.